The opposition to MLB’s deal that will allow Cuban pro ballplayers to sign with big league clubs without fleeing Cuba and without the need to establish residency elsewhere, is in part understandable: If you support the embargo, you want to limit any financial flows to Cuba. But I suspect there’s more to it. In Miami, some are surely rubbed the wrong way at the idea that Cuban players could play here without emigrating, without effectively breaking with the system, without joining el exilio. 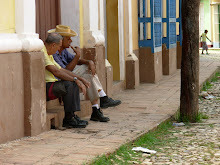 It certainly shows that those who want to block the deal are not interested in encouraging some positive changes in Cuba that made it possible: the ability for Cubans to travel and return, and the ability of pro athletes to earn market-based pay abroad and return to Cuba with those earnings. They are not being called desertores anymore. How do Cuban ballplayers see the deal that Senator Rubio wants to block? Look at the math from a Cuban player’s point of view. Say he signs a one-year, $2 million deal (half the MLB average). A “release fee” of $400,000 goes to Cuban baseball – paid by the club, not the player. If IRS applies U.S. tax (30%), that’s $600,000 to Uncle Sam, and the player pockets $1.4 million. Cuba decided recently to tax that income at 4%, not the 50% marginal rate applied to, say, a private restaurant or bed-and-breakfast with taxable income above $2000. Senator Rubio complains about the “new tax” Cuba is imposing (4%), but if it applied the 50% rate on the books since 1996, the player would pay more than ten times more! After paying the 4%, the player is left with $1.344 million – more than 2,600 times his salary in the Cuban national league. More on all this in this column in Cuba Standard.